Eyre was born in Saskatchewan and lives in the countryside outside of Winnipeg, and his work is rooted in the Prairies. However, his landscapes are not necessarily depictions of specific places, but are reconstructions of landscape elements. 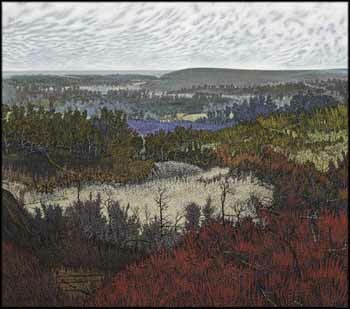 Eyre has described his landscapes as “geographies of the spirit,” and paintings such as Red Rough are distillations of his landscape experiences that contain a sense of crystallized, heightened reality. Works like this are tremendously still, as though the land is holding its breath waiting for something - the progression of the season through fall, the possibility of snow, or the distant suggestion of wind. Complex, sombre and majestic, Red Rough is a stunning work from the most sought-after part of Eyre’s oeuvre.